Jen found a tutorial on how to make a Weeping Angel tree topper, and with Impossible Astronaut Day tomorrow, it seemed appropriate to put up Jen’s step-by-step. The original tutorial can be found here. This crafting adventure started with a Barbie doll from eBay. Her hair was promptly chopped off. I took the remaining bits of hair out with a pair of tweezers. Now Barbie is bald. The next step was to cut off her legs. This particular doll had articulated joints, so it was easy to cut the elastic that was holding the legs on. The next step was to make the hair. I used an air-dry clay, easily located at any craft supply store. This enabled me to really work the clay the way I wanted to. And I kept a bowl of water nearby to keep the clay moist while working with it. I used a seam ripper for the line detail on the hair. The next step was to attach the body of the doll to a Dasani water bottle. Cut off the neck and bottom, and use packing tape to secure it in place. I then cut Barbie’s arms and remolded them, using the air-dry clay, into bent elbows. Next, I put a combination of paper towels and plastic bags inside the bottle, to provide stability. Now it’s time to make the skirt. I used sections of the air-dry clay, building up the layers until the entire bottle was covered. To get the flowing skirt effect, I took extra clay and put it on top of the base skirt, then blended the edges down. Here’s a closeup of all four sides. While waiting for the air-dry clay to dry (this takes about 24 hours with all the clay you’ll be using for the skirt), I went ahead and started work on the wings. 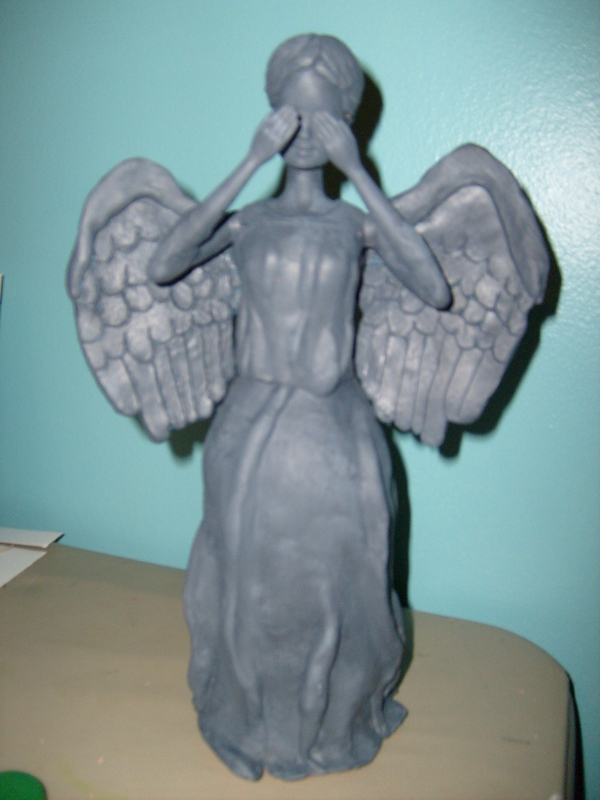 For the wings, I used oven-bake clay, as the tutorial suggested. I used a toothpick and followed the pattern I drew, which you can download here. Left wing, cut out and trimmed up. I put an extra piece of clay along the top of the wing, like I did for the folds in the skirt, to give it a little more depth. Here are both wings, before going in the oven. Here are both wings, after being in the oven. Here’s the bun, which I made seperately. It’s all dried. As the skirt dried, I noticed cracks. This is because I didn’t use enough clay in those places. More air-dry clay to the rescue! Once the skirt was dry and crack-free, I started on the shirt. Using a similar technique as the skirt, I put extra clay for the folds and blousing of the top. This picture illustrates the before of the blousing. And this is after everything was blended together. All the clay on the doll, and drying. All dry, and a closeup of the shirt. I used a toothpick to add the line for the shirt and the “bunching” at the neckline. For the fabric folds, I used the same technique I used on the skirt. I also added a thin layer of air-dry clay to Barbie’s face to help obscure her features. Now we’re ready for hot glue! I was a little skeptical, but the hot glue has worked beautifully. This is the bun, hot glued to the hair. Now the wings are hot glued on. The last unpainted view, from the front. All painted! I mixed black and white acrylic, with a color called “bleached sand”, which has just a hint of yellow. Once I got the base grey I wanted, I dry brushed a slightly lighter grey to give an older and weathered look. The first photo is with the flash, the second photo is without. So that’s it. The plan is to put this on display somewhere, and not on top of a Christmas tree, so if someone does that, let me know how it turns out! 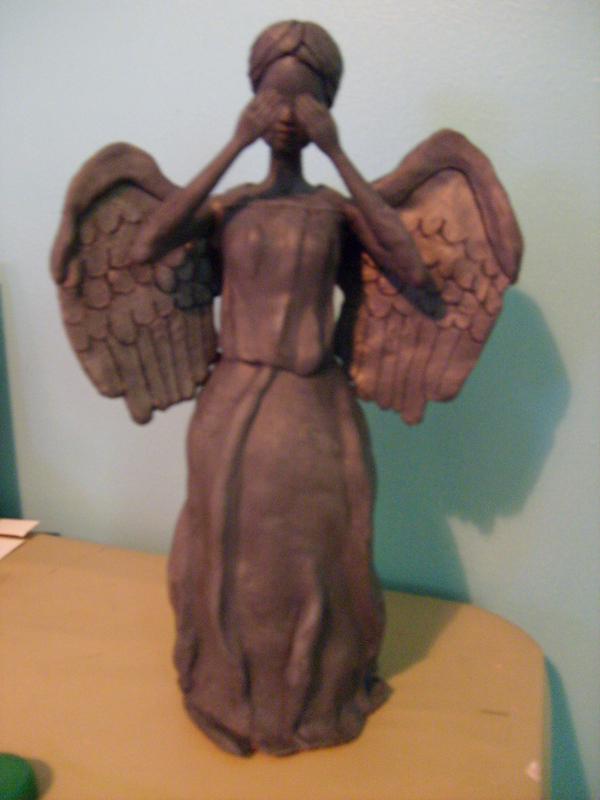 And remember, don’t blink. oh my gosh, I would never stop looking at my tree again.